While I first taught online at the University of Nebraska in 1995 (pre-LMS’s), I have been teaching continuously online since 2001. So I thought I would look back 18 years and 8 years, and compare my practice to today. In some ways, I have not changed at all…and in other ways, I am fundamentally different. Yet, even then, I was attempting to move beyond a correspondence course approach of provide content and then test. The courses I designed and the faculty I trained tended to employ grading that was 50% discussions and 50% tests. Teacher presence was strongly encouraged in the discussions. Tests employed pools of random questions, such that every student got a different test to mitigate against cheating…and to promote the idea that students could retake tests to improve their scores. Unfortunately, to develop those large pools of questions, we often used rather expensive textbooks with their publisher supplied support test banks (which were always of dubious quality). Most of my undergraduate students did their work on desktops…many in the large computer labs on campus…which made “distance learning” a misnomer. 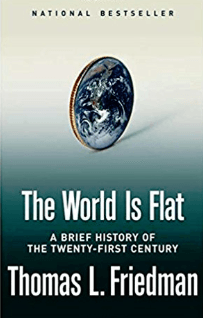 The book that most resonated with me during this period was Tom Friedman’s (2005) The World is Flat, which Friedman updated again in 2006 and 2007. Jump ahead to 2011 and I was now at VCU as the senior online consultant in their Center for Teaching Excellence. I was also teaching for the VCU School of Education, and I was developing doctoral level courses for Creighton University’s new Interdisciplinary Doctorate in Leadership. Most students were now using laptops rather than desktops. 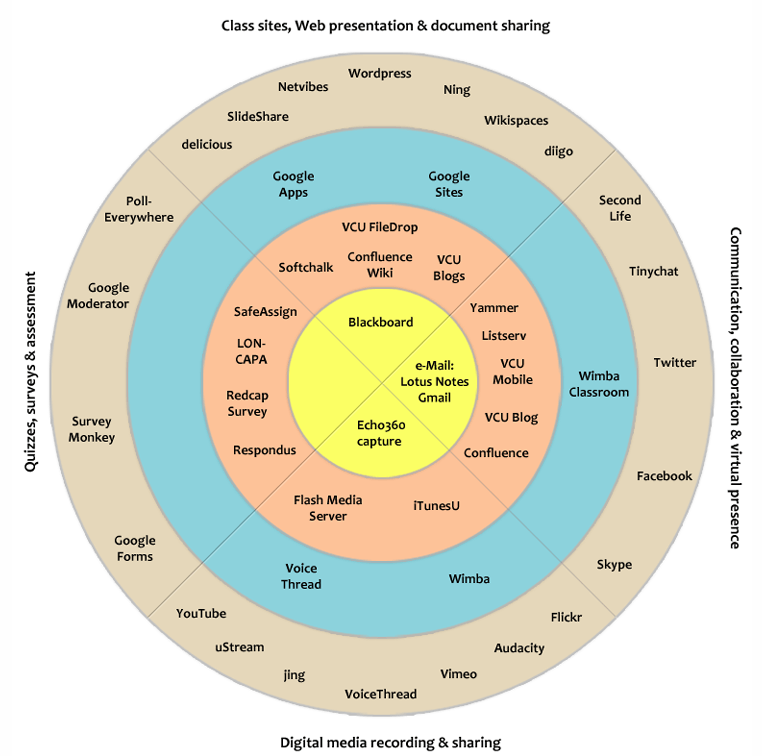 I was working in both Blackboard and Angel between the two universities…and was starting to experiment with building my own LMS using WordPress. 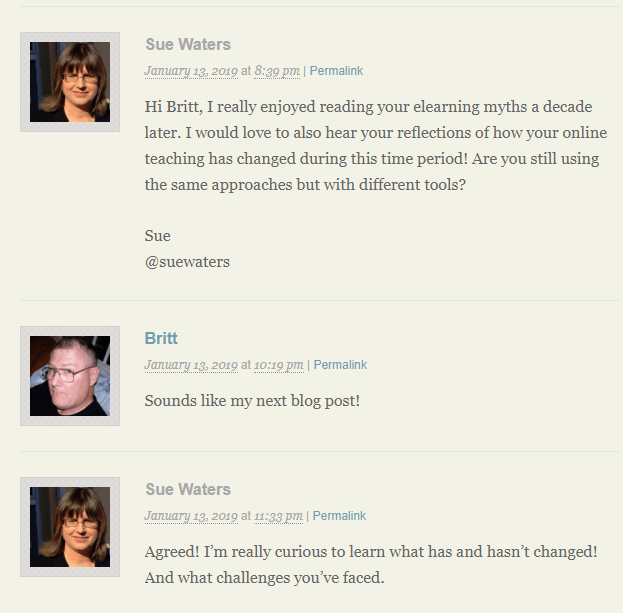 In my courses, I still used a discussion format, but now I was using blogs in some of my classes to provide a more open process for dialogue. I was now teaching only graduate courses, and I tended to not use tests. Grading was about one-third discussion or blog posts, one-third based on the quality of comments in discussions and blogs, and one-third on artifacts such as papers or presentations. Besides Friedman, I was influenced by Chickering and Gamson’s 7 Principles of Good Practice, which I felt equally applied online as on campus, and by Mishra and Koehler’s TPCK (later renamed TPACK). 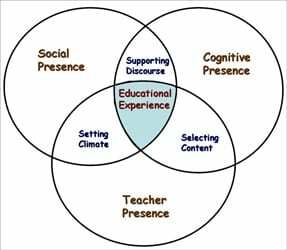 Garrison’s Community of Inquiry model and concept of overlapping teaching presence, cognitive presence and social presence was used as a foundation for our course designs. My philosophy had shifted to more of a constructionist approach, which made the courses more student-centered than teacher-centered. 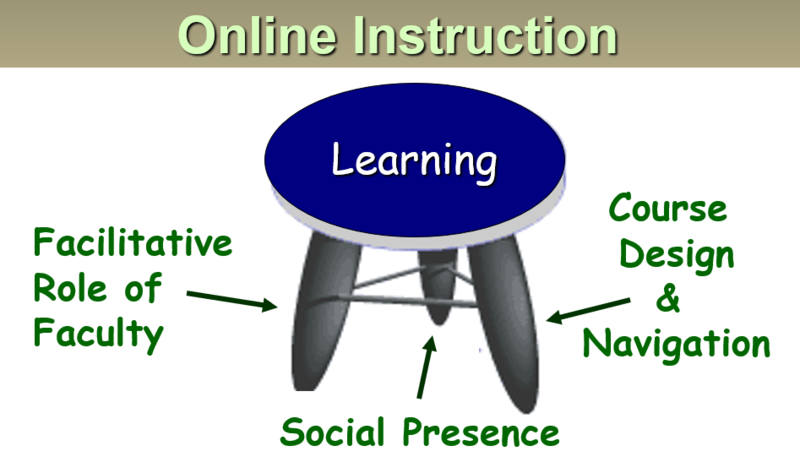 These concepts strongly influenced a white paper I published in 2009 with my colleagues Jeff Nugent and Bud Deihl, entitled “Building from Content to Community:[Re]Thinking the Transition to Online Teaching and Learning.” In some ways, this continued the idea of the three-legged stool above, but shifted the emphasis to the skilled facilitation of the faculty. Some of these tools have disappeared in the past ten years…and others have emerged. Today, there are still amazing options to use with teaching and learning. Now, I am retired as a faculty developer, but continue graduate teaching for several universities and colleges. My two platforms are Blackboard and Canvas. I have again shifted my approach to one more in line with connectivism. The grading approach of one-third discussion or blog posts, one-third based on the quality of comments in discussions and blogs, and one-third on artifacts such as papers or presentations continues. I would suggest that I have made two big shifts in the past decade in my teaching. I have replaced expensive textbooks with more timely thought pieces, and over the past decade, have used works such as Clay Shirky’s Here Comes Everybody, Dave Weinberger’s Too Big To Know, and Kevin Kelly’s The Inevitable to spark exploration. The second huge shift has been mobile. I use Twitter in many of my classes, and I note that students like the engagement that social media provides. These days, one needs to assume that students will access their classes using smartphones…in which Blackboard still does a lousy job but Canvas does better. And while Garrison’s Community of Inquiry and TPACK still influence my courses, I have also been influenced by the work of cognitive learning sciences, such as Susan Ambrose’s How Learning Works and Michelle Miller’s Minds Online. 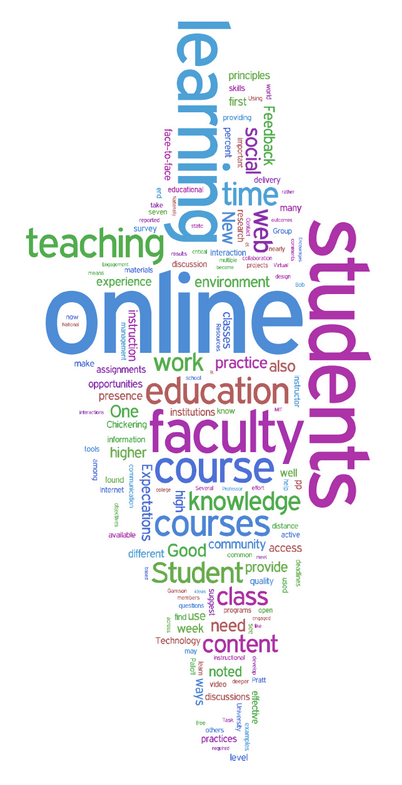 Summing this reflection up, I have obviously enjoyed teaching online…or I would not be still such an advocate for it! 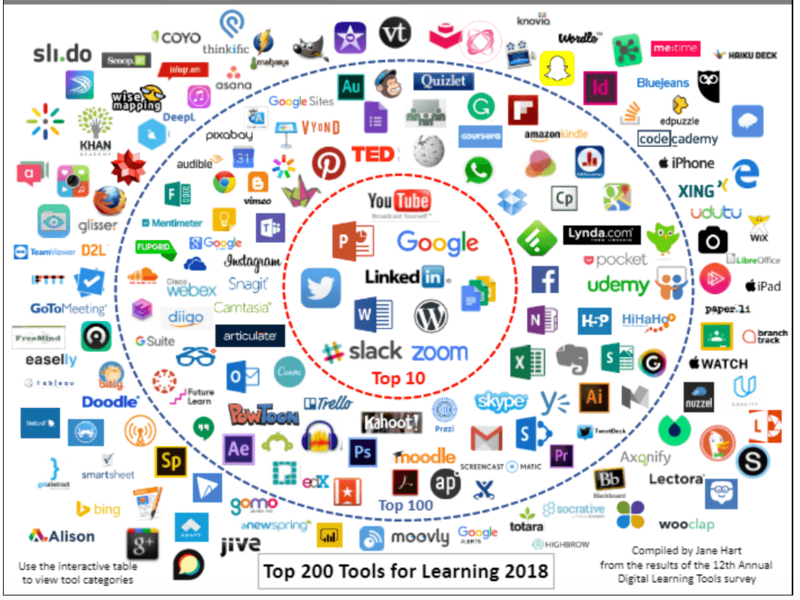 Even with all the amazing edtech available today, I still believe that the teacher is the critical element that makes elearning work – though strong facilitation and presence. But I have shifted over the years to now understand just how equally strong the teaching presence of my students can be…and I try to design my classes so that their voices are front and center. If I started as a teacher-centered professor and shifted to a student-centered professor, I would call what I do today as learning-centered, with myself as a co-learner. As to challenges, I would suggest that just keeping up is one challenge…but my Personal Learning Network of bloggers and tweeters has certainly helped me…as have my students. I use the term co-learning, as I continue to learn from my students every term! Another challenge may lie in access, as we seem to be a global society increasingly split by the have and the have-nots. I have been extremely fortunate in both my career trajectory (right place at right time) and by the all the privileges that come from being an old, white male. Those of us that are privileged need to acknowledge that privilege and work to better those that have not been. The next ten years should be equally amazing, as we humans begin to partner with artificial intelligence to enhance learning. I am looking forward to the continued learning this journey will provide! I’m really enjoying your reflections! Thanks for sharing them. ” The second huge shift has been mobile. I use Twitter in many of my classes, and I note that students like the engagement that social media provides. These days, one needs to assume that students will access their classes using smartphones…in which Blackboard still does a lousy job but Canvas does better. ” I hadn’t thought much about how students might access Blackboard on a phone. I normally see my son accessing his University LMS using his computer so hadn’t thought if he accessed on the phone. Then I went off on a tangent. Most of our themes are mobile friendly. The theme you are using on this blog is one of a few themes that we have kept that isn’t mobile friendly. It’s worth considering changing your theme to a mobile friendly theme since most readers view on mobile devices. I looked through themes a couple of weeks ago and did not see any that really resonated with me, so I did not change…but I was not thinking mobile. I’ll take a second look, Sue. I think your simple theme choice is apropos. Simple is never a bad decision when it comes to web design. Thank you for sharing your experiences with teaching online. As a classroom teacher and edtech coach at my high school, hearing how you plan and grade your online classes is quite interesting to me. I agree with you in keeping the student voices front and center …. particularly without nearly as much face-to-face contact, that is key. Good luck in your next ten years of teaching! I’m glad to have run into your site through the Edublogs blogging challenge. Hi Britt, apologies for the delayed reply regarding your new theme! I had checked the look on my mobile and needed to wait until I used my computer so I could compare with both devices. You are using Sanse which is one of our latest mobile friendly themes that is also an accessibility ready theme i.e. great theme for ensuring you’ve made your site more accessible. It was one of my favorite new accessibility themes so it was great to see it being used. The only thing I don’t like is how the theme is handling right and left aligned images on my phone. Text wrapping around images can be an issue on phones. I’ve compared with my mobile friendly theme and it looks like instinctively I’ve deliberately avoided left and right aligning images in posts and pages so I don’t have this issue. You’ll see I’ve decided to center my smaller images rather than wrap – http://suewaters.com/sir-arthur-conan-doyle/ It’s worth comparing how that page looks like on your phone with this post on your phone. You don’t need to change the alignment of your images; it is more something worth looking at to see what it looks like on a phone. Sue made a good suggestion, and you took it. I read this post on my phone since you asked for feedback about the new mobile-friendly look. It worked well now. It was a fascinating read. You have so much knowledge and history about online learning. I don’t have too much, but I was an adjunct education faculty member for a few years teaching hybrid classes so folks didn’t have to travel every week through rural northwest Iowa. I used Angel and then Blackboard. I think I would like to teach online courses someday when I retire. I appreciate your acknowledgement of being an older white male with all the privileges that had afforded you. I’m old and white, too, and agree we need to acknowledge a lot and repent. Have you read White Rage by Carol Anderson? Good suggestions, Sue…thanks! And thanks, Denise and tlcteach for the feedback!